ENJOY - The richness of underwater polynesian ecosystem offers you a unique advenutre to enjoy the beauty of ocean home, by interacting encounters with the marine wildlife found in the open ocean and the pristine lagoon, just perfect clear blue waters for viewing the sea life. Observe marine species in their natural environment, from the boat or during snorkeling. The southern summer warms Pacific ocean, whose temperature is around 84°f, a very pleasant immersion into crystal and colorful waters of Moorea, into a generous nature, to discover all its underwater biodiverdity. Just relax while experiencing insolite and unique adventure ! WELCOME on board a comfortable and spacious 27ft boat, with a rigid hull and wide shade cover. According to yoru preferences it's also possibe to enjoy a tropical sunbath on the front deck of its bow area. We welcome small group only, up to 12 guests, friendly and attentive, our experienced team guides you for a safe experience. EXPERTISE - Heifara, our renowned polynesian captain has an extensive expertise and a unique connection with marine wildlife. 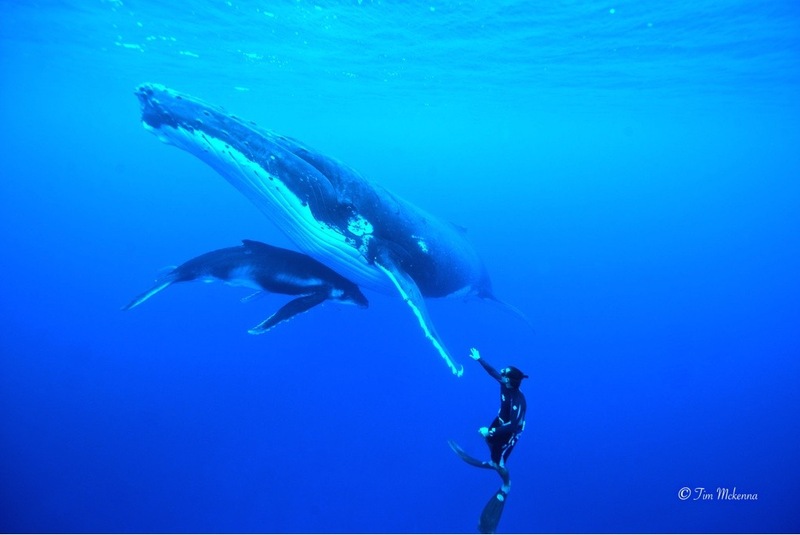 He operates since 1994 and was the first one to bring people into the water with humpback whales in Moorea more than 20 years ago. Share unforgeattable moments with wild dolphins ! DISCOVERY - ENCOUNTERS - RESPECT - During the boat tour we bring you on either watching and swimming with wild dolphins, and we focus to achieve the most natural encouter and get the best from the dolphins on their terms. Upon "invitation" by these very intelligent marine mammal, and if ocean conditions permitting, you may have opportunities to slip into the water for a safe swim, experiencing an up-close and personal encounter. During our approch we put great emphasis on patience and the utmost respect for the marine wildlife which welcome us in their natural environment. Any swim encounter is dependant on the dolphin behaviour. 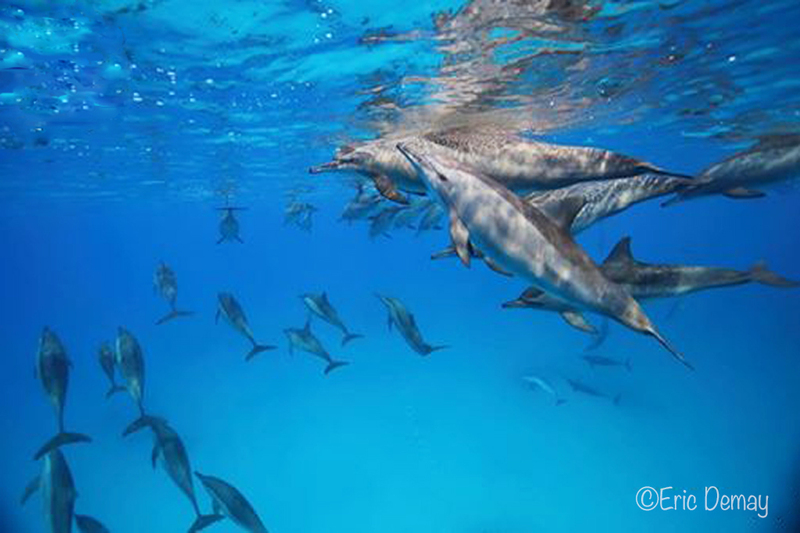 They are many large pods of spinner dolphins present around Moorea, renowned for their acrobatics. 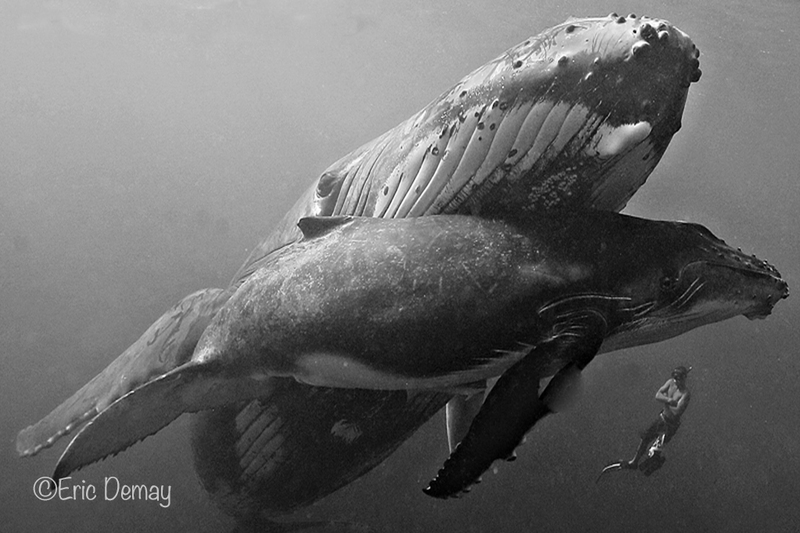 These curious cetaceans will offer you a pure moment of happiness thanks to their joyful and their beautiful energy ! RELAX in the lagoon, surrounded by crystal blue waters, and swim with graceful stingrays, who surprise you by their great sociability, lightly brushing up against you, and snorkel amongst black-tip sharks. The boat tour occurs mainly in the lagoon,, bays, and channel towars the outer reef. PLEASE NOTE : we bring you for interaction with wild animals in their natural environment, an excursion program is not exhaustive, and will be tailored to the opportunities of the day. Everyday is different ! Discover Moorea by boat to have an exceptional and unique panorama of this paradisiac island, with its famous bays and mountains full of history anf legends, as well as its beautiful colored lagoon. Immerse yoursef and snorkeling in the crystal blue lagoon, exploring its coral gardens, a fantastic natural reserve of tropical fish and many kinds of interesting marine life. You will also discover the unusual underwater sculptures in volcanic stone measuring between 5 and 6,5 ft, immersed in the lagoon in 1998. The sculptor Tihoti created this lagoon exhibition of a dozen tiki - polynesian symbol of the ancestor half-god, half-human which was the first man, a mythical character who procreates humans -. Inspired byMu's engulfed world, the artist made these artistic works to pay tribute to the polynesian ancestors who threw all their beliefs into the sea during colonization during the previous 2 centuries. • Briefing with details information about life, society, behaviour of spinner dolphins and other marine species. Details information about pick up are sent during booking processing. - shorty or lycra shirt, protecting from the sun during your swim. Hello, I tried calling but was not able to get through. Could we join you for a half day dolphin swimming tour to.orrow morning, Feb 2. We are visiting Moorea 21 April 2019 on a cruise ship. We are hoping to have a shark and Ray feeding tour and snorkeling trip. How many can fit on boat.